Gone are the days where a sturdy lock consisted only of a simple mechanical device and a key. Now the future is upon us, and we have digital smart locks. These locks not only allow you to do away with keys, they also put access control in your hands anywhere you have access to wi-fi and you have a compatible smartphone, tablet, or personal assistant. That means no matter where you are, you can provide or revoke access to any visitor to your home or business. So even if you are traveling away from home, you can let people in or out of your house as needed. Before purchasing a smart door lock, check to see whether it will fit your door. This means checking that it will work with the dimensions of your door, the material from which your door is made, and the orientation of the hinges (on the right or left side). Also be aware that some smart door locks are sturdy enough that they can hold up to harsh weather, but others are really only suitable for indoor locations. You do not want to purchase a smart lock only to discover that you cannot control it with your device. Make sure that your smartphone, tablet, or personal assistant is compatible. Also check and see if there is any additional hardware you need to purchase, such as a proprietary hub. You do not want to be surprised by additional charges needed to get everything up and running. Some of the best smart locks do require you to buy additional equipment—you just need to factor in all the costs before you go shopping. Do you need just several door codes, or will you be giving out a lot of door codes to neighbors, employees, extended family, friends, or so on? Make a list of the people you might be giving door codes so that you can add them all up and figure out what kind of entry code capacity you will need. Shop for a smart lock which will provide you with that capacity. That way you can maximize control over your home or business security setup. 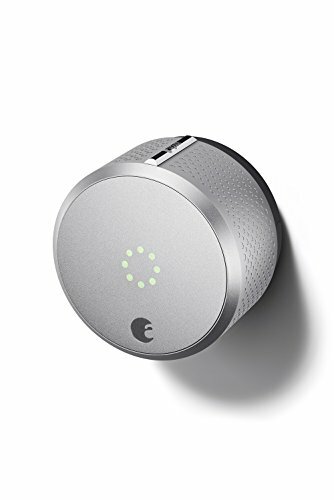 One of the best things about smart locks is that some of them come with cool high-tech features which provide you with additional control over home or business access. For example, there are door locks which are able to detect your location. If you are approaching the door from outside, they may unlock automatically to let you in when you touch the lock. If you are indoors, they will keep the lock secure so that your family is safe. Another advanced feature which some smart locks include is tracking. With this feature, you can check your lock’s history to see who has locked or unlocked it, who has accepted eKeys, and so on. You can even have notifications sent to you when certain users lock or unlock your door. This may be helpful for monitoring your home when you are on vacation, or checking to see if your kids are home from school. August Smart Lock is an incredibly popular smart lock online which includes a lot of great features. It is compatible with Amazon Alexa and comes in a silver or dark grey finish. You do not need to remove your existing deadbolt; you can add it alongside that deadbolt for extra security. It can be installed in a matter of minutes. You can use your smartphone or tablet to control your lock. At any time from any location, you can provide users with access to your premises or you can revoke those privileges. Have Amazon Alexa, Google Assistant or Apple HomeKit? You can lock or unlock your door through voice control using any of these personal assistants. Note that you do need to purchase August Connect in order to set this up. Installation is fast and easy, even for beginners. You do not need to do any wiring since the lock is powered entirely by battery. When the battery is low, you will get a notification sent right to your smartphone. This lock provides you with 24/7 logging. That means you can check your smartphone to see who has been using the lock. The lock unlocks as you approach automatically and then re-locks behind you. This feature is optional and can be switched on or off at your convenience. You actually do not need August Connect for remote operation, but only if you happen to have a recent model of AppleTV. A few customers mention flaws with the mechanics, saying that the lock is not entirely reliable. So there may be some quality control problems. On the whole however, the vast majority of buyers do not seem to encounter these issues. This touch-to-open smart lock is another one to consider, especially if you are looking for a lot of powerful extra features. You can get it in three different finishes: Satin Nickel, Polished Brass, or Venetian Bronze. There is a blue light ring built into the lock so that you can locate it easily in the dark and see whether it has responded to your Fob or smartphone. This lock has a touch-to-open feature for your convenience. If a user does not have a smartphone, they can purchase a Kevo Fob which enables the same touch-to-open capability. Compatible smartphones include those with iOS and Android operating systems. The lock can tell when you are in or outside your house (assuming you are carrying your smartphone or Fob). If you are inside, it will keep your lock secure so that you are safe. If you are outside and touch the lock, it will open to let you in. If you purchase the Kevo Plus hub for $99, you can set up the Kevo app to work with Alexa. This allows you to use your voice to send commands to the lock. You can get free ekeys through Kevo, and can send and manage them using your smartphone or tablet. Kevo maintains a log of lock activity, so you can monitor who is coming or going through your door at any time from any location. You can connect the Kevo smart lock not only to Alex, but also to a wide variety of other smart home devices. These include Ring Doorbell, Nest Learning Thermostat, Skybell, Android Wear, Honeywell Thermostats and IFTTT. SmartKey Security protects the lock from forced entry. The lock is UL Fire Rated, BHMA Certified, and ANSI Grade 2. There are some users who have complained that the lock is finicky or awkward, but they are by far and away the minority. If you end up needing to purchase Fobs and the Kevo Plus hub, that will add significantly to the price tag for your purchase. Of course, it is a great lock, so it is still a good value even if it is not cheap. 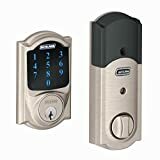 This deadbolt is a great choice if you are looking for a smart lock which provides you with extra functionality in the form of a built-in alarm. It is rated to provide ANSI Grade 1 Highest Residential Security and includes a resistive matte finish to shield the touchscreen from smudges and fingerprints. This lock is compatible with Amazon Alexa. You do need to buy a hub in order to enable this functionality for voice control. You can store as many as 30 custom user codes. This device doubles as an alarm. There are 3 different alert settings you can use: activity, tamper, and forced entry. Through Z-wave technology, you can lock or unlock your door using your smartphone from any location where you have a connection. 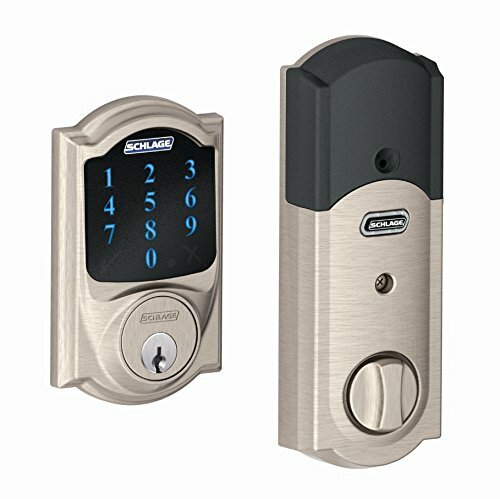 If you have a Z-wave automation system, your lock will be compatible with it. You can install this lock using nothing more than a screwdriver. Installation should take less than an hour. There is an indicator to let you know when your battery is low. A few users reported that the lock did not work for very long and needed to be replaced. Thankfully this affected only a small group of buyers. The vast majority say this lock has worked great for years.